The best thing about having a style diary is that some days I just play dress up, for no other reason than to prance around in something I wouldn’t normally wear..
Would I wear this outfit on the regular? Chances are no, you will not spot me in my local Tesco’s doing the weekly shop in this attire but it was just such a fun ensemble! 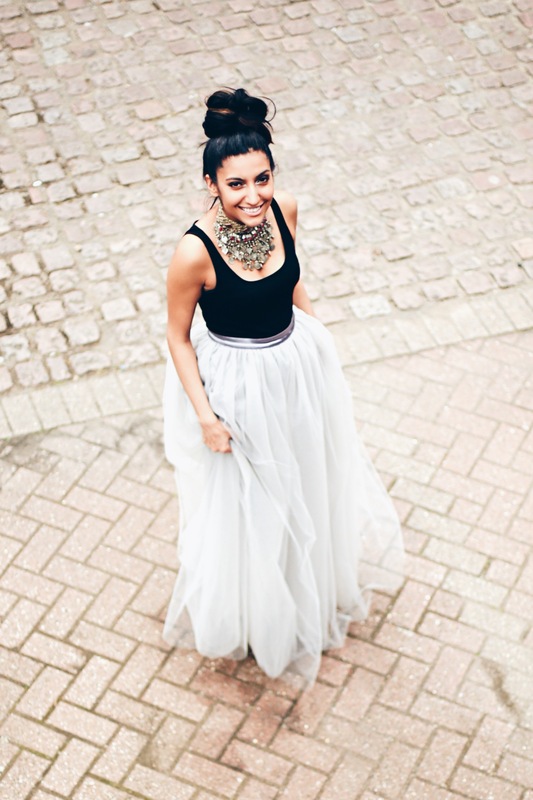 This divine tulle skirt from Nasty Gal truly makes you feel like a princess when you put it on. The layers of tulle matched with the icy silver tone of the skirt are perfect for a fun festival outfit or team it with a sparkly top for an alternative prom look! I teamed the skirt up with a plain black vest from Topshop and some gorgeous heels from Kurt Geiger that were a birthday gift from my beautiful housemate! I thought the heels would be a good way to dress up the look a bit more considering the top was so plain, but as they were hidden under the tulle, they didn’t distract too much away from the skirt. To balance it all out, I grabbed a handmade ethnic collar with turkish coins that I had picked up on my travel years ago. The whole coin necklace seems to be a huge trend at the moment, so I have linked to a similar, stunning necklace from Shantique Designs below. Would this outfit rate it at the top of my practicality list? No but would I wear it again just for the fun factor? Hell yes! Would you? I’m heading off to Lahore this Saturday and while I am excited to see friends and family, I am dreading the 50 degree weather! No idea what to pack! We might be in the Swing of Spring but with grey skies returning, I brightened up my day with this ensemble that is just exploding with colour..
As many of you already know, printed bombers are all the rage this season. Flamboyant silky bombers with decorative touches were on show everywhere on the Runway from Phillip Lim to Jonathan Saunders to Stella McCartney. 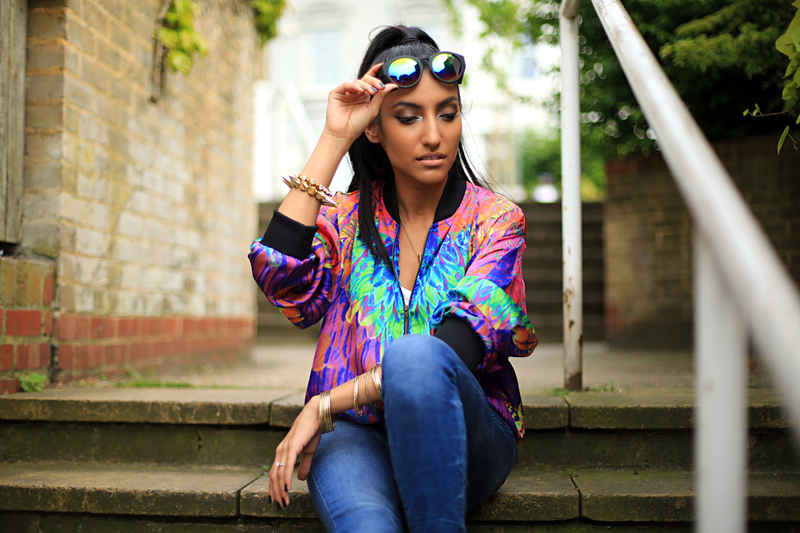 In this post, I am sporting a gorgeous printed silky bomber by Textile Federation via Urban Outfitters. It is simply stunning. 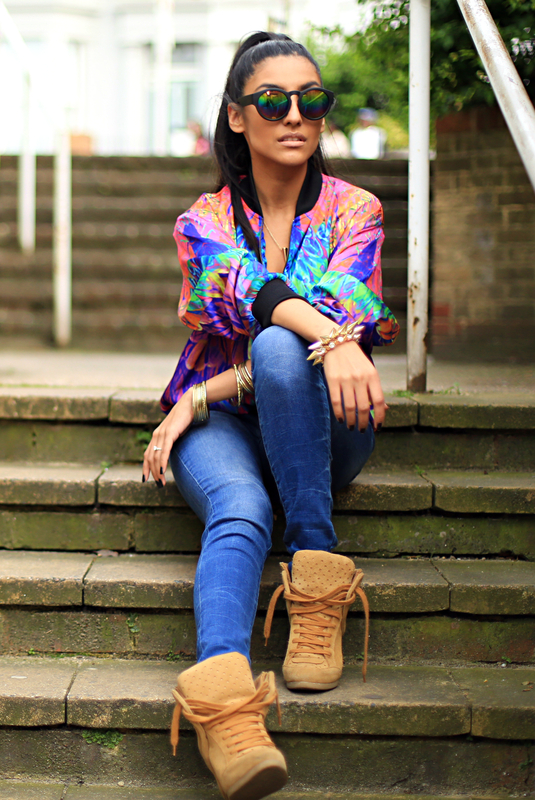 The print is bold and the colours make it extremely eye catching. The style makes it ever so perfect, bang on trend for this seasons Sports Luxe look. I teamed it up with a pair of Demi Curve skinnies from Levi’s and some tan coloured wedges from Zara (Old but similar here). To accessorize, I grabbed a couple of spiked bracelets and necklace from Claire’s and of course, an amazing pair of iridescent sunnies from Accessoryo. I’ve had these glasses for a while now but wanted to style them with the right outfit and when I received my gorgeous bomber, I knew at once that they would be a match made in heaven. 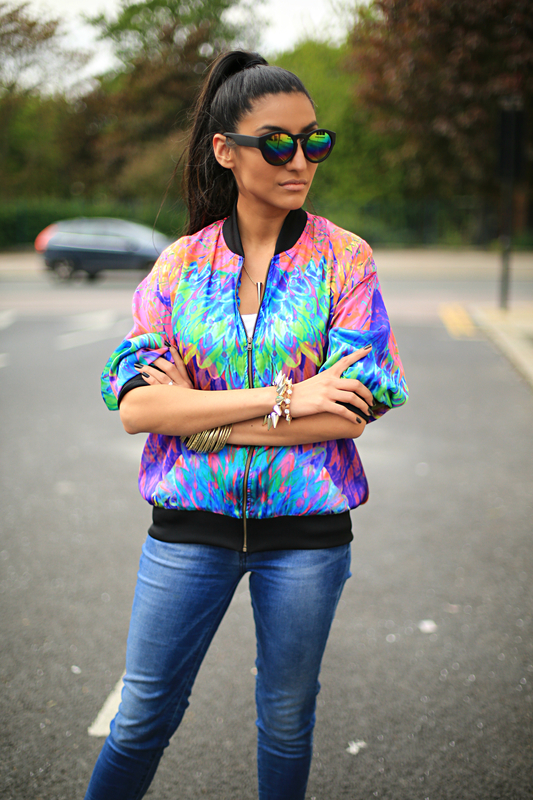 The bomber and the sunnies manage to balance each other out, rather than one outshining the other. The sunglasses themselves are amazing, a great style and amazing quality.. and the best bit? They cost a mere £8.95!! I don’t know if you can tell, but I had so much fun shooting this look. It was so comfortable and colourful that I couldn’t wipe the smile off my face throughout! Hope you guys like it as much as I do! Thanks for reading my lovelies.. until the next post! As you all know, I am a complete sucker for an interesting hat.. usually, the bigger the better however this time I went for a real head turner! 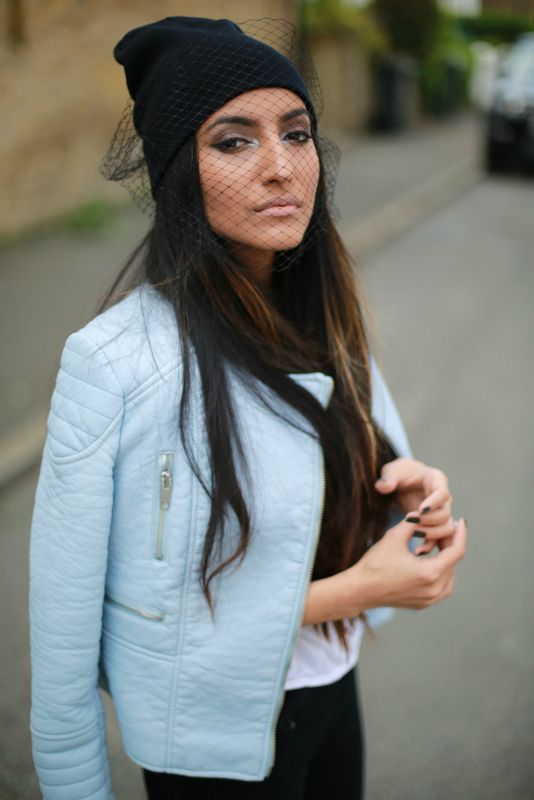 Having spotted the veiled beanie originally on the Jil Sander SS ’12 runway, I thought of it as a bold accessory suited more for the pages of Vogue and the like rather than a Sunday stroll down London streets but when I spotted this beaut on the Nasty Gal website, I thought I would give it a go anyway! I teamed my black distressed denim from Daisy Street with a white crop top from Topshop, draped a blue faux leather jacket from Zara and wore my gorgeous Loviri blue brogues from Shelly’s London via Tower London! With everything going on within the ensemble, I only added one additional accessory, which was a beautiful pair of chandelier earrings from Vintage Styler. I don’t normally wear earrings but I thought these were so gorgeous and they added a feminine touch to an otherwise edgy look. Sooo.. what do you guys think? 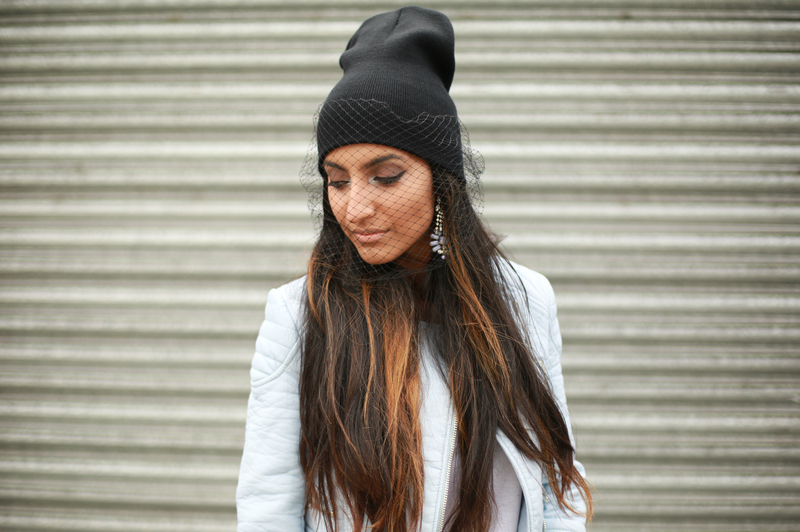 Would you rock the veiled beanie? More recently, I’ve really started appreciating how lucky I was to have grown up in the 90’s. Us 90’s kids had it all.. Backstreet Boys, Buffy The Vampire Slayer, Scrunchies and Gwen Stefani as a style icon! 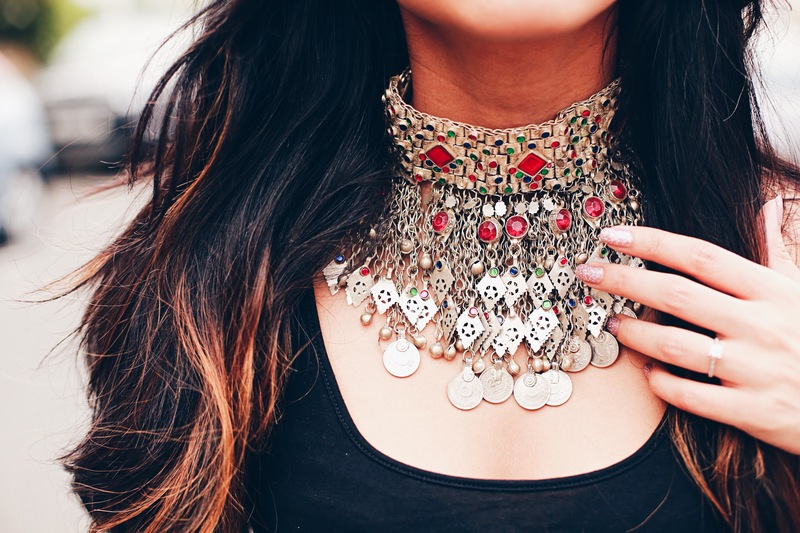 With tattoo chokers, holographic clothing and bindi’s creeping their way into popular spring and summer looks, 90’s fashion is making a clear comeback and I thought I would do a post to celebrate that very fact! 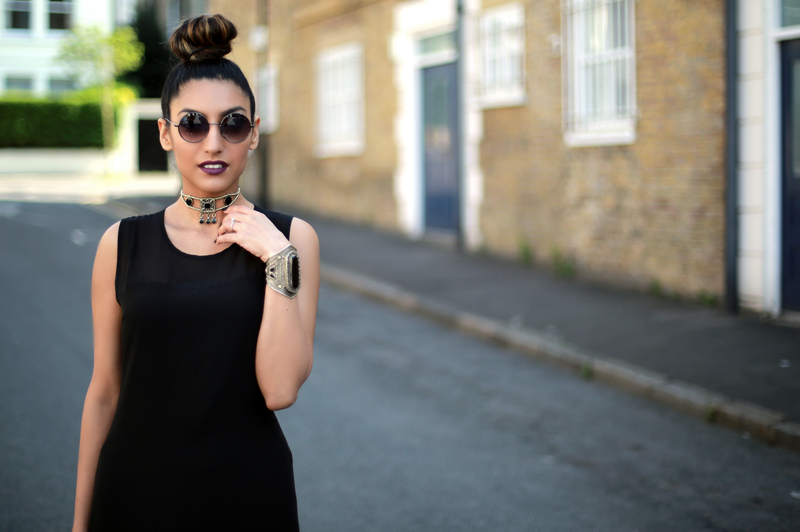 Basing my whole look around a gorgeous black sheer layered maxi dress from Yumi Direct, I pulled my hair into a super tight top-knot and opted for uber dark makeup. I really love this maxi dress as it’s so comfortable and looks just as good with a pair of converses and a denim jacket.. a summer must have! I accessorized with an Afghani black and silver choker and matching ethnic cuff and finished the look off with my See by Chloe wedges and some vintage sunnies. So, what do you guys think of the 90’s style comeback? 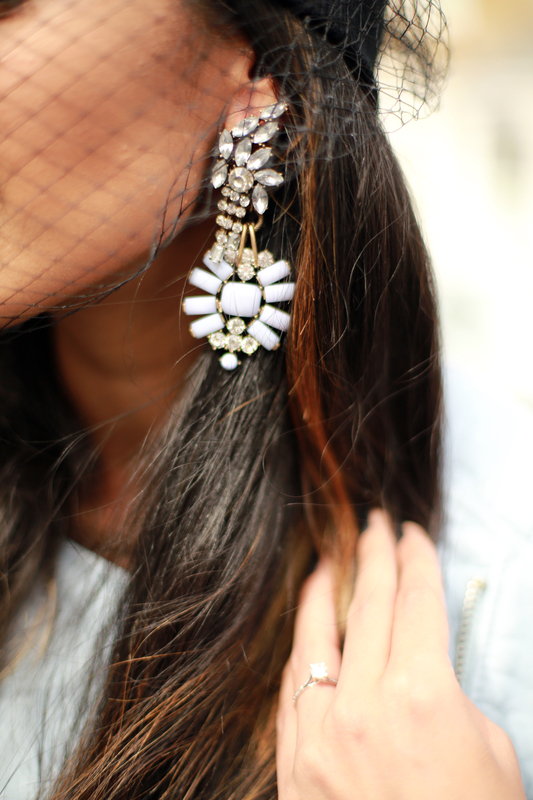 Will you be sporting a similar look this season? Hope you all have a fabulous long weekend! As always.. thanks for reading my lovelies! Until the next post!